We are looking for dedicated and passionate team members to help us pursue our mission. As part of the MIT community we have access to fascinating and diverse opportunities across campus including music, theater, cultural associations, athletics, guest speakers, and workshops. 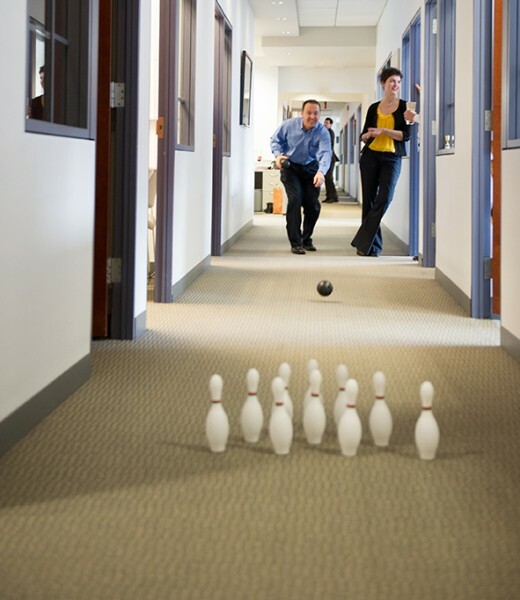 Here at MITIMCo we try to carry the creative spirit of MIT into the social environment of the office. At MITIMCo we value constructive debate, continuous improvement, taking initiative, and having fun! Of course, we also offer MIT’s outstanding benefits package. MITIMCo’s small, collaborative environment of approximately 70 employees means you will get to work closely with a group of talented and passionate individuals. We have a strong culture of teamwork and trust. MITIMCo employees take great pride in their support of MIT’s mission. You will play an important part in supporting the life-changing innovations and research that happens at MIT on a daily basis. At MITIMCo, we believe in giving you responsibility from your first day. Instead of undergoing an impersonal training program, you will be immersed in interesting work alongside supportive colleagues who will help you excel. You will have the flexibility to manage your time and the freedom to come up with creative solutions. MITIMCo prides itself on its lively atmosphere. We fuel this environment through a variety events and activities that encourage interaction across the office. From softball games and mini-golf tournaments to cooking contests and book club discussions, we are always looking for ways to integrate fun. "Before my time at MITIMCo, I knew essentially nothing about investing, save for what I had learned in my Financial Investments class... Yet at MITIMCo, I was able to learn about investing and various investment strategies in a hands on manner." Favorite part of my work at MITIMCo: I get to meet and work with some of the smartest investors and listen to their insight and experience, which is extremely intriguing and fulfilling. "The wealth of experiences [managers] brought to MITIMCo was breath-taking, and gave me a glimpse into the all-star league of finance." This organization is a wonderful place to work for anyone who is deeply interested in making a difference as an investment professional… [MITIMCo] attracts fabulous people and creates a collegial, competitive, and fun environment that is extremely hard to beat. Favorite part of my work at MITIMCo: The strong culture of teamwork, and the opportunity to work alongside an exceptional group of talented, insightful colleagues. "I got an enormous amount of help and advice from pretty much everyone in the company… Even as a junior person, I was given a lot of responsibility and worked directly with the most senior people in the firm. The culture is very flat and open-door." My MITIMCo experiences: I appreciate the opportunity to learn from my coworkers. Any day I learn something is a good day and I have had an uninterrupted string of good days since joining in June 2010. Work at MIT that inspires me: I am inspired by MIT's entrepreneurial roots and culture of innovation. This enables the brilliant minds at MIT to mobilize their world-changing ideas towards solving the world's most challenging and complex problems. Having a platform to develop relationships with some of the brightest minds in the investment world combined with the incredible mission of "MITIMCo made for a truly rewarding professional and personal experience… as an MIT alum, I had firsthand experience to appreciate how much of a difference MITIMCo makes." Favorite part of my work at MITIMCo: Building and managing spaces that people use to pursue their dreams. The team is collaborative and the work is challenging and rewarding. For anyone with a passion for investing and the desire to make a positive impact, MITIMCo is a tremendous career opportunity. Favorite part of my work at MITIMCo: It’s like being part of a family, a family that is incredibly passionate about the work they do and the reason they do it: to support MIT. Favorite part of my work at MITIMCo: Being constantly challenged. Best part of my work at MITIMCo: Learning people's stories about how MIT impacted their lives and the reason they are making a gift to the Institution - so that they can give back. Favorite part of working at MITIMCo: The culture of learning and the encouragement of independent judgment. Favorite parts of working at MITIMCo: Working with and learning from a small, closely-knit, group of very smart people, while contributing to MIT. I also like walking through campus buildings and being able to peek into the labs and classrooms to see the incredible research and learning here. Favorite Cambridge lunch spot: The Kendall Square roof garden in spring and summer. MITIMCo is located in the heart of Kendall Square, steps away from the Charles River. Kendall Square is a vibrant innovation hub, burgeoning as a result of entrepreneurialism both on- and off-campus. In addition to the constant stream of talent from MIT and other local universities, the area attracts people from around the world to work at leading science and technology companies. Kendall Square is also an exciting spot for startups, with facilities like the Cambridge Innovation Center that provide flexible workspace. Kendall Square is rapidly becoming a dynamic cultural spot, featuring many highly-rated restaurants and cultural events. There are many activities to explore just outside MITIMCo’s doors throughout the year which include: picking out produce at the weekly farmers market, kayaking on the Charles, ice skating in the Square, and catching films at the cinema. Plus, Boston is just a quick ride away on the T! MITIMCo’s vaunted Mudhens take the field every spring as part of the MIT Intramural Softball League. The league runs from late May through early August, making it a great opportunity to get outside, enjoy the weather, and bond with coworkers. Everyone is encouraged to participate, regardless of skill and experience. MITIMCo’s very own Rewards and Recognition Committee is dedicated to the highly serious task of planning fun social events, group outings, parties, and volunteer events. All of us at MITIMCo value these dedicated moments to socialize, refresh, and celebrate both our professional and personal successes. MIT is committed to giving back, and there are a number of ways through which to do this. One program that MITIMCo regularly participates in is Community Giving at MIT, a campus-wide philanthropic initiative that enables members of the community to give to organizations that support local health and human services. MIT strongly encourages enhancing professional development through further education. All MITIMCo employees are eligible for MIT’s higher-education tuition assistance programs, counseling, and training. Employees are also able to attend on-campus workshops and lectures. Several times a year MITIMCo invites members of the MIT community to share their work with us over pizza. These lunches are an ideal chance for us to learn and develop richer understandings of the work that goes on at MIT outside of our office. Past presenters have covered topics that include the financing of biomedical research, new discoveries in online education, the MIT admissions process, pioneering developments in cancer research, and incubating successful businesses. At MITIMCo we take learning seriously and look for ways to blend this into our daily lives. Our optional monthly Book Club is one way we stay current. The books we read are chosen by attendees and span a range of topics including business, history, psychology, and culture. Recent titles include The Everything Store by Brad Stone, The Second Machine Age by Erik Brynjolfsson and Andrew McAfee, and Surely You’re Joking, Mr. Feynman! by Richard Feynman. How do you like our site? Provide your feedback here.